We have a roundup of our favorite Snoopy baby bedding sets used in the latest Snoopy nursery themes for boys and girls. 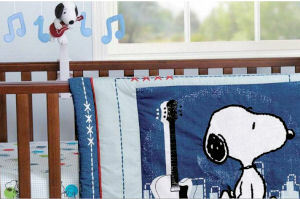 There are several selections in Snoopy baby bedding sets that come with all the items and decorations that you will need including window treatments, wall hangings and more for your decorating project as well as some tips for DIY decorations to make yourself. This is perhaps the best chance you will ever have to display all those Snoopy collectibles that you have saved since you were a kid rushing to the breakfast table on Sunday to grab the Peanuts comic strip. If you are looking for ideas for a baby boy's nursery theme Snoopy and his buddy the Flying Ace Red Baron will be a no brainer for decorations. For a baby girl's nursery theme, choose Snoopy fabric in pink with Lucy, Peppermint Patty, Marcie or Sally to keep Snoopy, Lionel and the rest of the gang company! 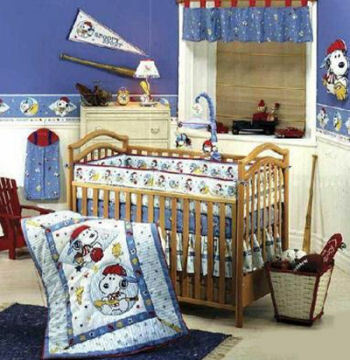 There are always several sets Snoopy baby bedding sets available some better suited for a baby boy's nursery then a baby girl's room because of the sports theme. But most of the crib sets are unisex or gender neutral. All that's required is that you are a fan of the Peanuts cast of characters with Snoopy front and center. 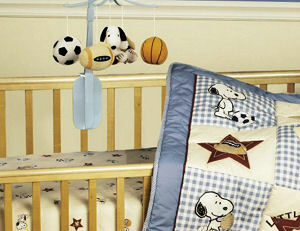 Go here to see more Snoopy crib sets, window treatments and nursery decorations for your project. Can you picture a nursery where Snoopy is living the dream as a rock and roll star, dancing to Hip Hop music while playing his guitar? Snoopy and the Peanuts gang are so popular they are featured in Nativity scenes for the holidays so why not as rock n roll stars? The Peanuts gang are champs at whatever they do! Fans of baseball, football, basketball, soccer and even tennis all love to see their favorite characters on the team. Snoopy and your baby are likely to form bonds that last for life. Best friends forever right out of the funny paper. You might create your own artwork using a few cutouts of the comic strip taken right from the comic strip or paste up some Baby Snoopy jumbo wall stick ups. You'll be amazed at how beautifully the colorful items look when matted with coordinating mat boards and frames. Of course there are Baby Snoopy pictures available to frame in glossy print if that's what looks the best with your Snoopy bedding set. If your nursery lighting is not that super or if space is not really what you would love it to be, the answer is mirrors! A Peanuts Snoopy Joe Cool Wooden Wall Mirror with Shelf and Pegs along with some of your other Snoopy art may be just what you need to coordinate with your nursery wall painting techniques, murals and Snoopy baby bedding. Top a table with a Snoopy Sport Lamp with Shade. What a delightful tablescape that features Snoopy decked out in primary colors that you can pick up in your Snoopy baby bedding and paint colors of the room. Choose from any number of Snoopy themed fabrics and designs available on the market. There is surely an ensemble to fit your needs no matter what nursery furniture you choose or what budget you are working with. 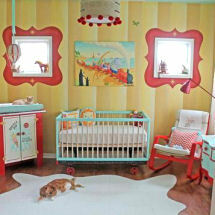 The choices range from the cheap discount brands to the ones suitable for the most luxurious nursery decor. 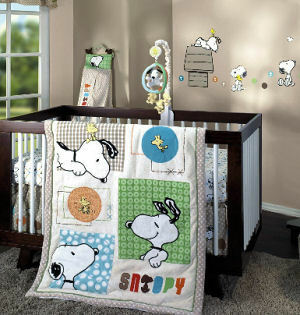 There many pictures of baby rooms with Baby Snoopy items on display here on Unique Baby Gear Ideas that will inspire your own designs with more pictures coming in every day so please come back often to see what's new with our favorite Peanuts cartoon character.